Our aim to to provide the best rollerski instruction, with sessions to suit you. We offer a variety of different ways of learning - group classes and courses, private instruction and our rollerski club. We always try to get you rollerskiing safely and technically well, to allow you to transfer your skills to cross-country skiing on snow, should you want to! Our instructors have a great sense of fun, and enthusiasm for rollerskiing and cross-country skiing which they will share you. Developed to allow cross-country skiers to train specifically when there's no snow, roller skiing replicates almost exactly the health benefits of cross-country skiing - one of the most highly regarded aerobic sports. It exercises all major muscle groups, it's easy to learn, and it'll get you fit very quickly or be very good cross-training for other sports. It's a low impact alternative to running, it will get you ready for skiing on snow, and it's great fun! Our instructors will get you rollerskiing with good technique, safely, and aim to make it an enjoyable experience. 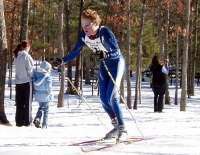 All our instructors are experienced cross-country ski racers with a love of the sport. We focus on getting you skiing with good technique to allow you to transfer skills onto snow. There are 2 types of rollerskiing, classic and skating. Both are straightforward to pick up with good instruction. Find out more here. 6. Team Dorney + Redridge training. We now offer rollerski + shooting courses for learning the skills of biathlon at Redbridge Cycle Circuit in Essex and Dorney Lake in Windsor. You can find details of these courses here. Please fill out a safety and objectives questionnaire, and bring it with you to your first session. No skating or skiing experience is required. Client feedback and reviews of rollerskiing - what people have been saying about our instruction. Get a taste of rollerskiing, with one of our group class lessons. An instructor will get you kitted up and teach you the basics, and help you improve. An enjoyable way to spend a couple of hours, and a good introduction to the sport. These sessions take place each week at set times, and last approximately 2 hours (including 30 minutes for changing into equipment). These sessions are for both beginners and improvers, and take place in a friendly group environment, usually with no more than 5 people. £32 per person per session in Hyde Park and Dorney Lake. Equipment is included in the price. Go to the class section to book classes. (£22 instruction-only in Hyde Park). You can then come back for another class, or join a course which follows a more structured approach. We run intensive one day courses, and longer 5-week courses which enable you to build up your skills with a structured approach. For beginners and more experienced skiers. Our one day courses at Dorney Lake near Windsor and at Redbridge Cycle Circuit in Essex are perfect for those who wish to learn as much as possible in as short a time as possible, with intensive tuition. Ideal for anyone living out of London, Dorney Lake is just off junction 7 of the M4 and is not far from either Reading or Heathrow airport. Nearby Windsor has some great hotels, enabling participants to combine sightseeing with rollerskiing. Redbridge Cycle Circuit is not far from the bottom of the M11 / M25. We occasionally run 1-day courses at other venues, such as Castle Combe in Wiltshire, the Brownlee Centre in Leeds and Ascot in Berkshire. £87 per person, including equipment hire, £72 per person if you use your own equipment. Youth discount here. A light lunch is included, the day is 10am to 4pm, with lunch break. Our five session courses are 4-weeks of technical instruction, followed by 1 'training' session. The first four weeks follow a structured approach which allows you to develop skills and skiing. You build up technique, as well as balance, strength and fitness over the the course. The fifth week is a training session, with less technique and more distance, and is an introduction to our regular training groups, which you can join after the course. Each session is approximately 2 hours. £128 per person including equipment hire, £98 excluding. Maximum number of participants is 8. Courses take place in Hyde Park, classic and skate, and Victoria Park (East London), all courses. Youth discount here. See courses page for more information. Groups of 6+ people - for private and office parties, schools, sports clubs and ski teams. For younger skiers, we run discounted sessions at all our venues, see here and we have discounted training membership. Also, we offer discounts private instruction, for parties, school and youth groups, see here. We now run courses for biathlon, which is cross-country skiing and shooting. We do this at our Dorney Lake (nr Windsor) and Redbridge (East London / Essex) venues, and also Leeds. You can find more information here . Our instructors are available for personal instruction at venues in London (Hyde Park, Victoria Park, Battersea Park, Richmond Park), Windsor (Dorney / Eton Rowing Lake), Surrey, Oxfordshire and Cambridgeshire. A 90 minute lesson will introduce you to the basics of the technique, balance, and all you need to get going. Subsequent lessons will refine technique, and help you ski faster, as technique, fitness and strength improve. We ask you to print out and complete the safety and objectives questionnaire attached before you begin. This will help us understand your fitness levels and focus future sessions on your own objectives. Costs - see private instruction booking page. Equipment included are roller skis, boots, poles, helmets and padding. We ask you to bring your own gloves. Groups - we can also arrange sessions for larger groups such as ski teams, corporate groups, schools, sports clubs and hen parties. See groups section. Our rollerski club meets in London's Hyde Park and Victoria Park each week. If you have the basics of rollerskiing, and want to train and improve, with coaching input each week, the club training group is for you. It's a really friendly group which has grown to over 60 regular members. The cost is £34 per month (excluding ski hire) and £46 per month (including ski hire) if you pay by Standing Order. (£19 / £29 for juniors and students). For more details see our Club Page. We also run regular training at Dorney Lake and Redbridge, with out Team Dorney + Redbridge group. For any more information please contact us either by email or call Iain on 07968 286129 or 020 8348 2540..